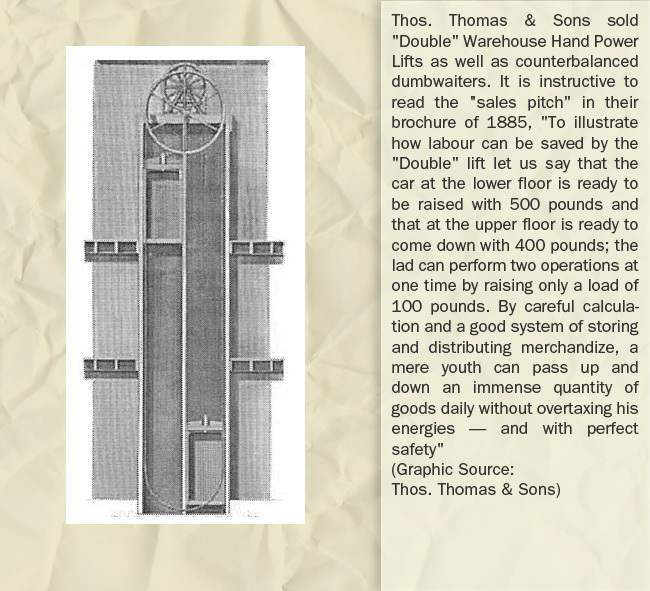 Elevator industry members have always been intrigued by the heavy lifting accomplished through the eras -- ore buggies, locomotives, trucks, ship and stage lifts have allowed elevator engineers, manufacturers and installers to show their muscles. On the other hand, many individuals and businesses requiring the lifting of as little as 25 pounds of ore samples or important correspondents have not been forgotten. 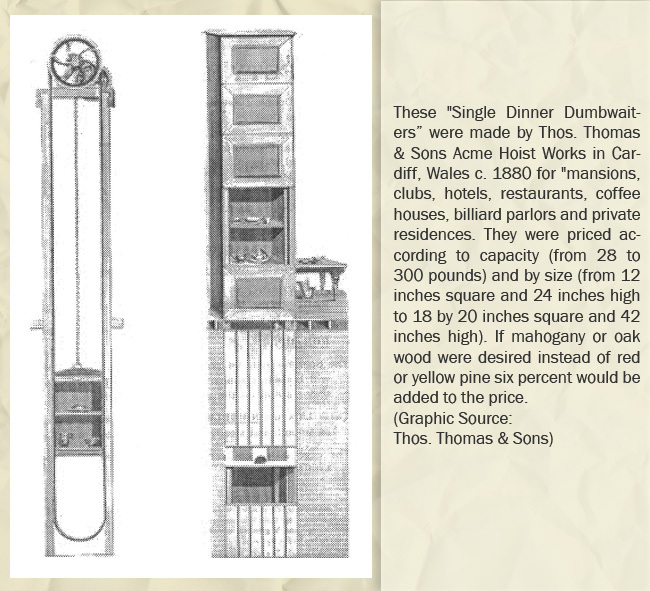 The ill-named "dumbwaiter" -- one of the first lifts -- steadily claimed its adherents. The advent of electricity made the mini-lift smart, deciding which floors it would serve and in what order. 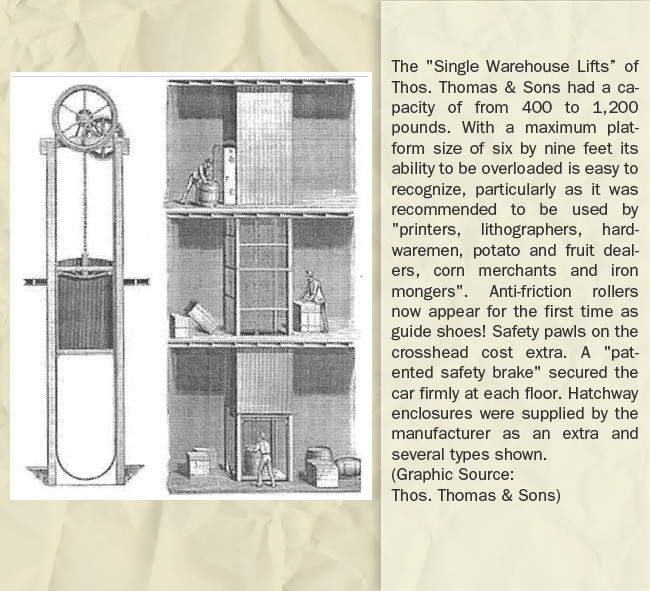 Some of these smart lifts were designed to seize containers and deliver them to the proper floor. These servants were often so well concealed under the counter in a restaurant of bank that they received little credit for the time and effort they saved! Mini-sized or mini-cost? 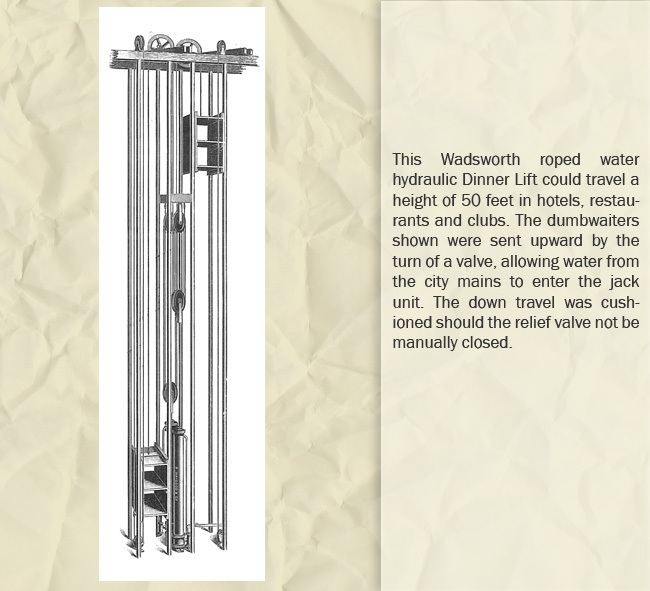 The elevator industry continued to provide large and small, heavy duty and light capacity, fast and slow, simple and complex. The hand-power lift -- the first to serve man -- remained as part of the industry's stock. There were always clients who occasionally had a small, lightweight task to perform, but when it had to be performed, it was considered critical. For such tasks, the old veteran was brushed off and not found wanting! 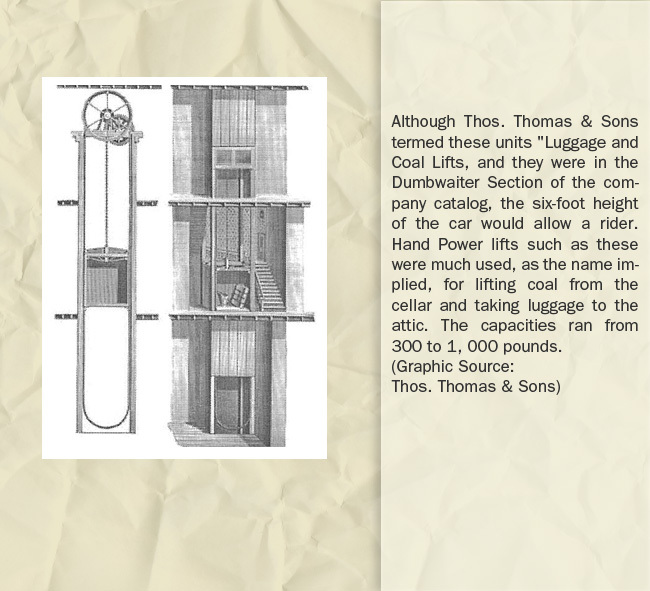 The lifts powered by hand were the first to lift goods on a platform. No doubt, involved workmen seized the opportunity of riding on the platform, and it could be said that these primitive lifts were the first to carry passengers, taking them out of buckets, bags and reciprocating rods. 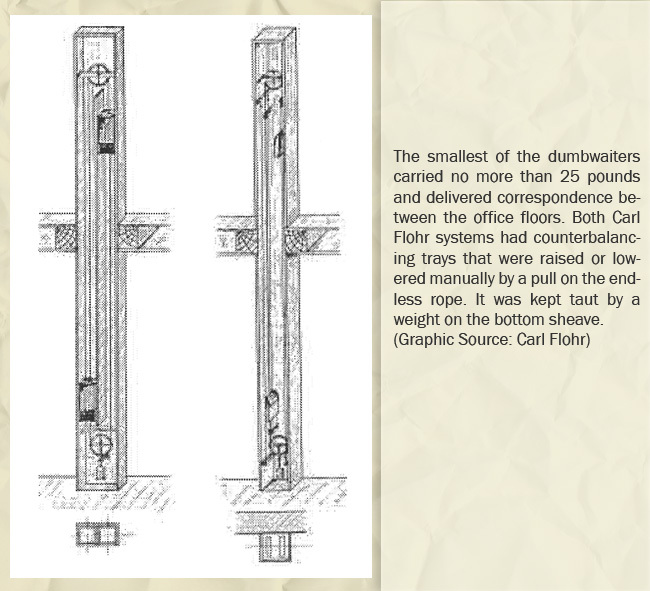 In the dim past, some entrepreneur, recognizing the limitations of what a hook on the end of a rope could lift, conceived the idea of substituting a cross head, stiles and platform, then running wooden rails up each side of the hoistway to keep the platform lined up with the holes in the floors. A car safety of any sort was yet to come. 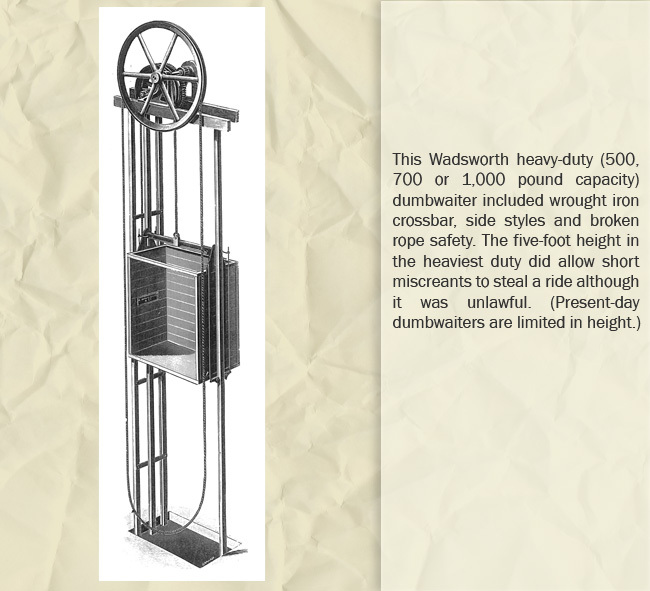 The hand-powered lift went on to become counterweighted and involved various styles of roping and gearing -- even brakes. 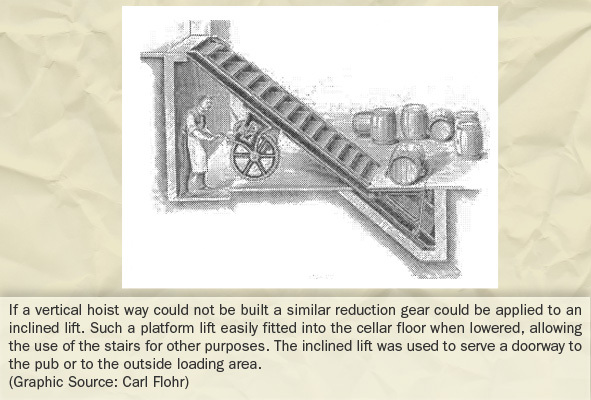 Eventually, when a belt led off a steam drive, replacing the bull wheel rope or windlass, many a hand-powered lift found itself a pioneer in the act of modernization! This veteran was economical to operate, and where the usage was spasmodic and time not of the essence, it filled the bill well. 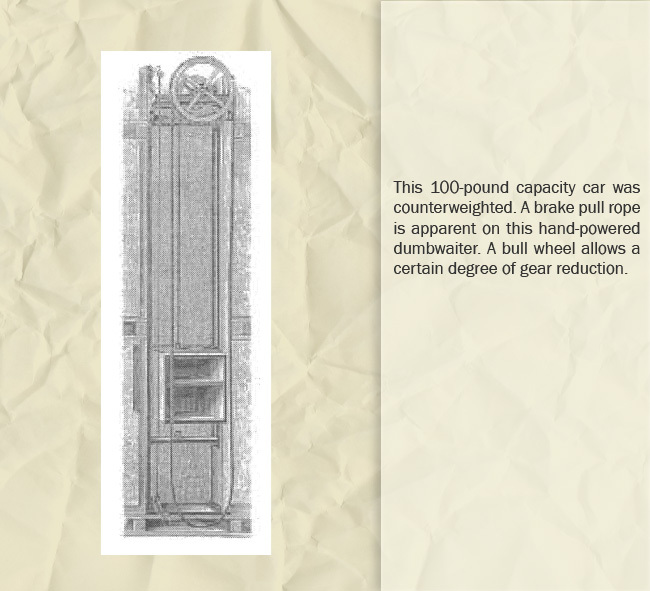 Capacities ran from 500 to 10,000 pounds, and if adequate muscle was available, a "horseless carriage" could be raised for storage. The hand-powered type had the longest history of any lift. 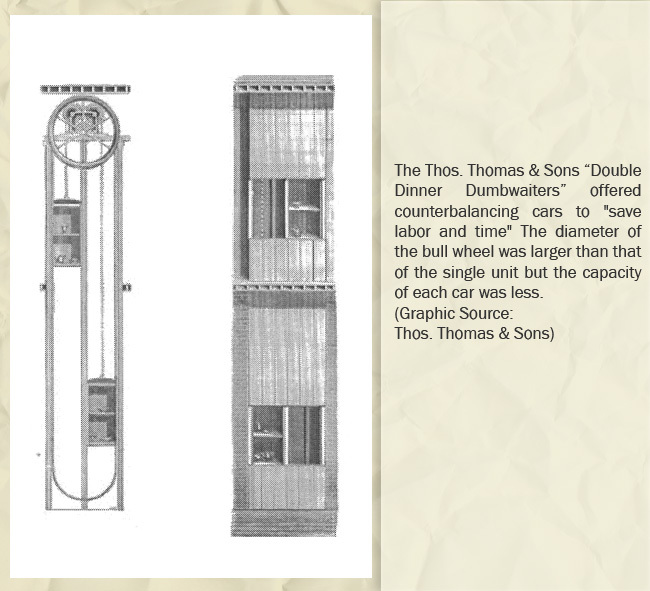 The not-so-dumb "Dumbwaiters" were also hand powered in its history but such mini-lifts have a history of their own in another Gallery. 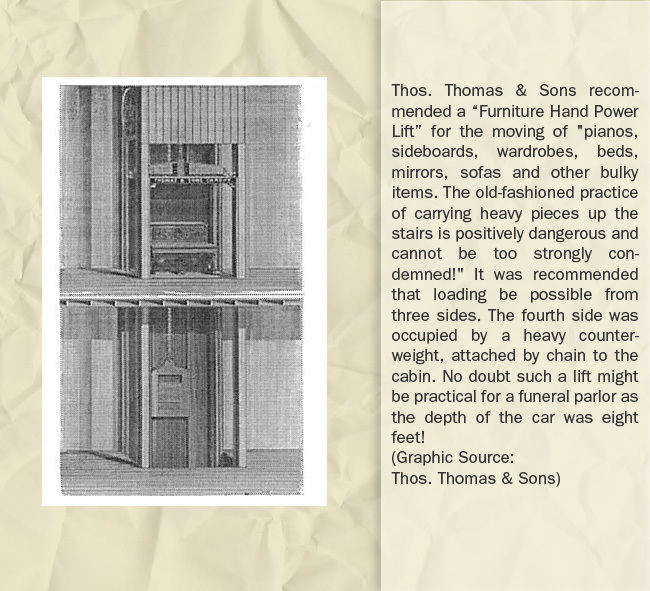 It may have been difficult to distinguish a small-sized hand-powered goods lift from a large dumbwaiter in the era of lifting by muscle. However, when the latter moved into the palaces and manors of royalty and the aristocracy, it became refined to where it could be hidden away and discreetly move food and other small necessities between upper living floors and the kitchen and servants locations in the basement. The small car performed the same service in restaurants, allowing the noise and odor of cooking to be isolated from the patrons. No doubt, this was where the silent servant earned the name "dumb waiter"! The mini-lift may have been silent but it did not remain dumb. A 25-lb capacity car could carry correspondence as well as medication within a pharmacy or hospital. 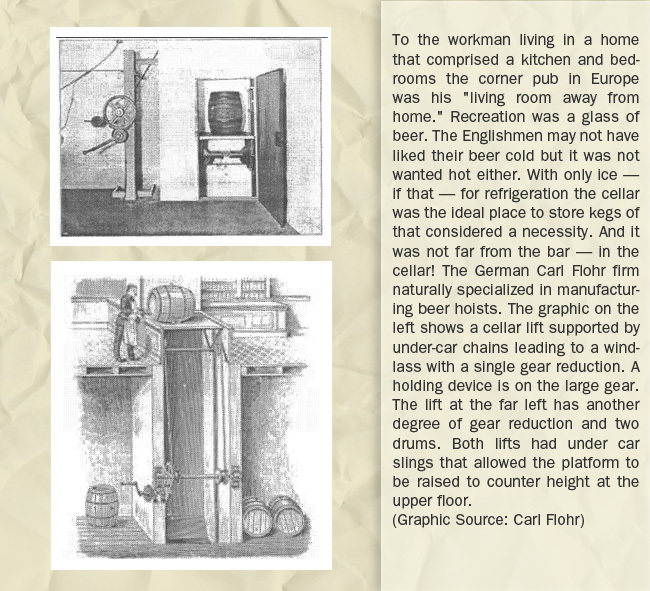 A 500-lb car could raise a keg of beer from the cool basement to a position underneath the first floor bar. And, the special "bullion lift" in England was designed to carry coin and gold bar within a bank. 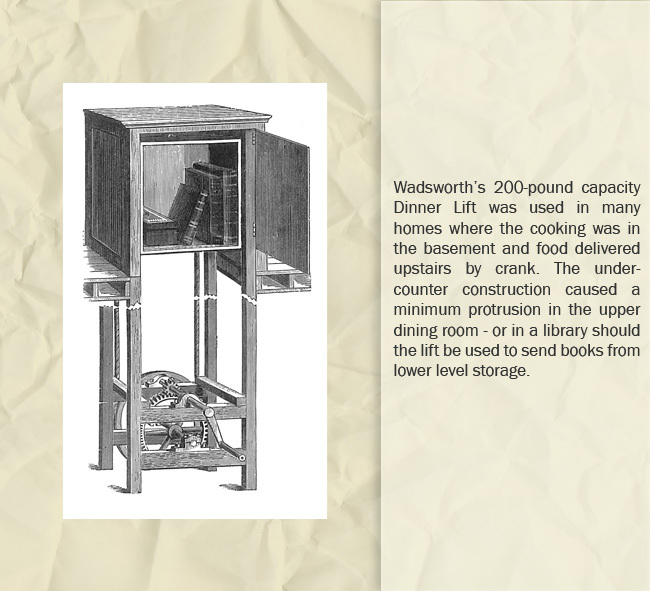 The dumbwaiter easily made the transition to electric operation with the drive at the top or bottom of the hoistway and the control evolved from a shout up the well to simple "Call and Send" push button, to elaborate systems in which a car would seek out a floor, unload its contents and travel to another floor for automatic loading. 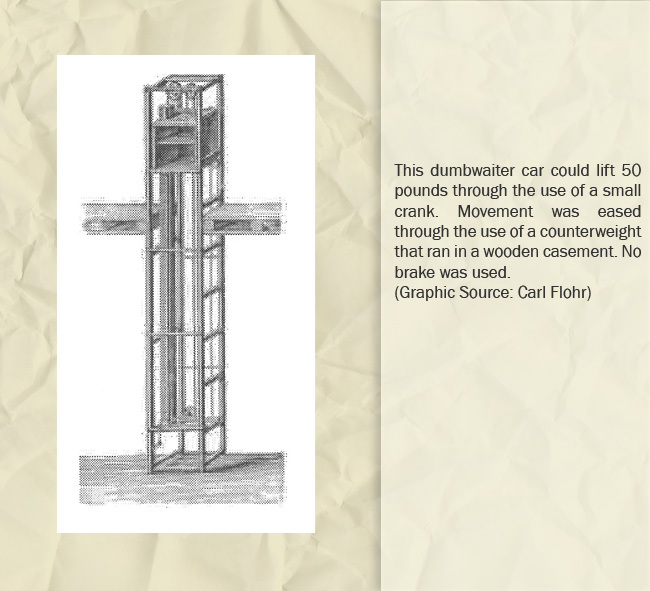 Distinguishing the dumbwaiter was its inability to handle a passenger -- no control ever existed in the car. Because of its modest size, dumbwaiters for two or three landing were eventually developed as packages for swift insertion on site.